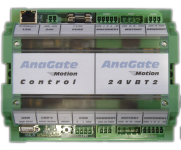 The AnaGate Motion system consists of various modules that supports the control of different motor types (24Vdc and 400Vac. An enhancement of the base functionality is available via optional modules such as digital and analogue inputs and outputs, encoders, ... All modules are controlled via an CANopen interface. Via a special control module it is also possible to control other connected modules decentralized. This control module is operated by an linux opereartion system (kernel 2.6.27) on a 400MHz ARM9 CPU (64MB RAM, 256MB Flash) and can be accessed via simple API programming in C/C++ or individually extended with local batch programs (LUA script language). A preliminary description of the individual modules and their mode of operation is available in the documentation area. Please contact us if you need further information about AnaGate Motion.